Deciding to start something new can be nerve-racking, but with the right equipment and knowledge, you can be making your way out of ‘beginner’ and into that ‘advanced’ class in no time. Over 20 million Americans have taken to practicing yoga, a rich and fulfilling way to find tranquility and get fit at the same time. Many factors need to be taken into consideration when you’re looking for the yoga mat that’s right for you. Luckily, yoga doesn’t involve having loads of technical kit, just a few key pieces which can make your sessions much easier. It is important to make an informed decision before purchasing so that the equipment you use doesn’t get in the way of your practice – and helping you to get the most out of every session. It’s a big misconception that yoga is easy – but with enough practice, anyone can do it! So, what should you be looking for in a yoga mat? The following list has been tailored to help you find just what you’re looking for! This might seem an obvious point at first but, in practice, it’s one of the most crucial factors. Many yoga practitioners suggest that keeping it light would be more practical, especially if you are traveling to and from a yoga class – lugging a large, heavy mat will more than likely put you off your journeys. Of course, if you’re practicing in the safe space of your home, then this is not as important. You should consider just how much padding you really need which will help you decide just how much weight is necessary for your optimal comfort. This, of course, is what will also affect the weight of your matt. It is where it becomes essential to consider what is right for you, if you’re new to yoga then you may want a bit more padding, while you’re getting to grips with your sunrise salutation it’s important not to strain yourself too hard and put more pressure on your joints than necessary. If you’re unsure where to start, the average yoga matt thickness is a ¼ inch thick, you could start here and work your way down. The material of your mat is key here, the last thing you want while in the middle of your downward facing dog is to slip further and further away from yourself. Before purchasing your mat, you can always run your hands across the surface to test the grip/slip ratio – if you slip pretty easily even before you get the exercise sweats going, then it is probably better to avoid that and find another one. We’ve already mentioned weight, but size is another matter. People come in many shapes and sizes – and so should yoga mats! Be sure you get a mat that fits your physique, so you’re not working with either too much or too little. The key to this is simple – if you’re a very tall person, then you will need a longer mat! One of the most significant conversations right now is keeping products environment-friendly and avoiding toxins. 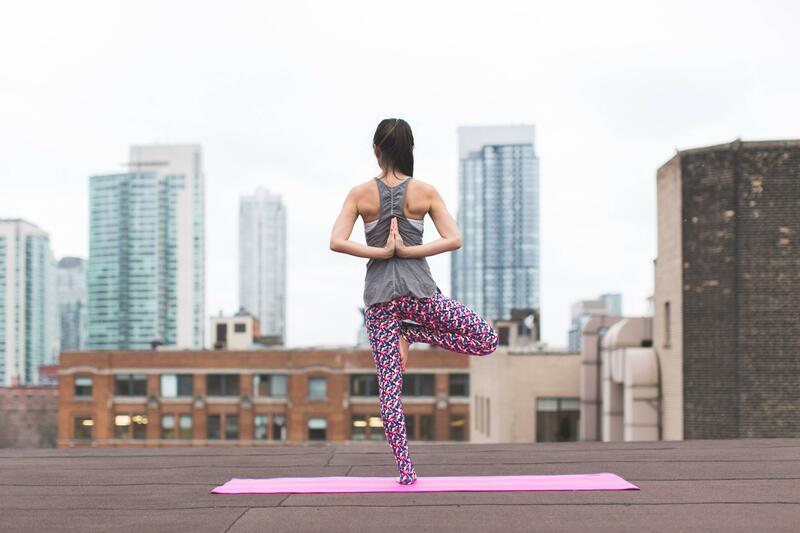 Some yoga mats can contain PVC which has been condemned as causing toxic pollution, so when you are out shopping always check the label for what your mat is made out of! Now you have a bit more knowledge about choosing your favourite yoga mat, it’s time to take the plunge and go looking!